Jacob Berkowitz squares off with an opponent. The senior recorded a pair of wins in the Wildcats’ split weekend. Northwestern finished its dual season this weekend, splitting a pair of Big Ten road matches to give the team its seventh win of the season and locking up a bottom-three finish in the conference. The Wildcats (7-8, 2-7 Big Ten) began their road journey against Maryland (2-13, 0-8 Big Ten) on Friday, taking down the last-place Terrapins 23-16. The team then had a quick turnaround, traveling to No. 11 Rutgers (12-4, 6-3 Big Ten) on Sunday, when it fell to the ranked Scarlet Knights in a 28-6 blowout. Despite only coming away with a single team victory this weekend, coach Matt Storniolo took a step forward. After finishing last season with a 2-13 record and going winless in conference play, Storniolo has experienced a significant uptick in success this year. But for the Cats, these last two duals meant more than just giving the team its second conference win in two seasons. These matches gave NU’s wrestlers a final opportunity to make a statement before the Big Ten Tournament. Entering Friday’s bout, 165-pound sophomore Johnny Sebastian had missed the team’s last two matches and lost two out of the three matches prior to injury. However, Sebastian showed no mercy in his first match back. 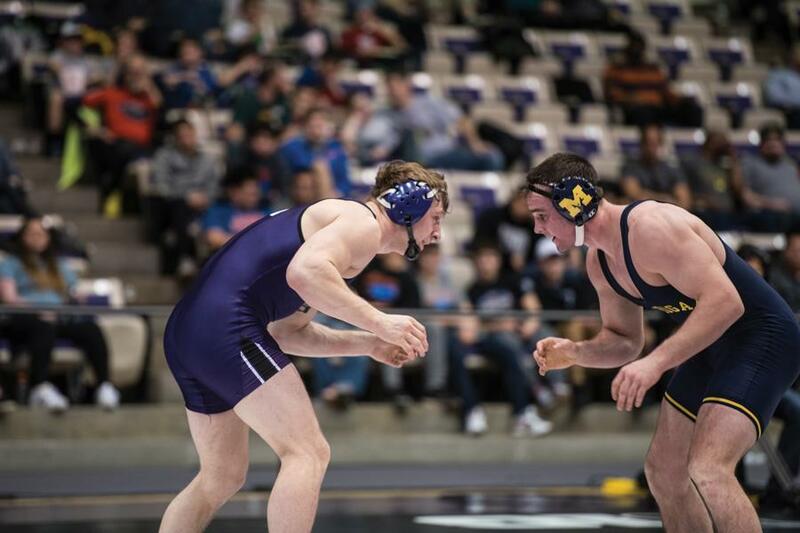 The sophomore recorded a dominating 16-4 major decision against Maryland’s Patrick Gerish. The New Jersey native then followed suit in his hometown’s state school, pulling out another major decision in a 14-2 win. Sebastian wasn’t the only wrestler with the Big Ten Tournament on his mind. The Cats’ triad of upper-weight wrestlers, junior 184-pounder Mitch Sliga, heavyweight sophomore Conan Jennings and 197-pound senior Jacob Berkowitz, all competed for a higher ranking in March’s conference tournament. The trio’s efforts were met with varying levels of success. After losing his last two duals against Illinois and Penn State, Jennings failed to get back in the win column. The heavyweight continued to struggle, falling to unranked Terrapin wrestler Youssif Hemida in a 5-2 decision and losing to Rutgers’ heavyweight in a 3-2 tiebreak. Sliga found more success than Jennings, defeating his Maryland opponent by a 10-3 decision, before falling to a ranked Rutgers opponent. Sliga has lost four out of his last five matches, with all four losses coming against ranked wrestlers. Berkowitz, on the other hand, breezed through the weekend, winning both matches and bringing his team-leading win count to 22. The Cats will return to action during the first week of March, when they travel to Bloomington, Indiana for the Big Ten Tournament.